In an article published last year, security spokesman Alejandro Poiré and María Teresa Martínez argued that the Mexican government’s strategy of targeting high level drug lords did not increase violence. The authors analyzed the specific case of the killing of Nacho Coronel and concluded that the increase in violence in the states of Jalisco, Nayarit, and Colima did not start with the killing of Nacho Coronel, but rather preceded it and coincided with the kidnapping of his son, which started an inter-cartel war between his organization and the Beltrán Leyvas. To backup their claims Poiré and Martínez used weekly drug war-related homicide data which are not publicly available (at least not to people who question the Mexican government’s strategy since they did make it available to Joaquín Villalobos). 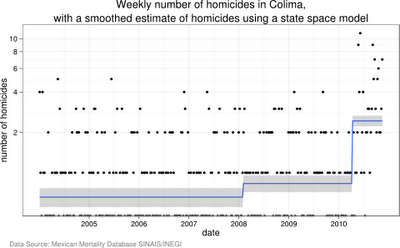 To perform my own analysis I’ll use the daily (grouped by week) homicide data available from the Mexican vital statistics system and confine my analysis to the state of Jalisco. Fitting an AR(1) model to the weekly data I find two breakpoints whose 95% confidence intervals contain the capture of “El Mochomo” (week 212), and as Poiré and Martínez state in their article, the kidnapping of Nacho Coronel’s son (week 327). The breakpoint coinciding with the capture of “El Mochomo” is where things get interesting since Poiré and Martínez did not include it in their analysis of the rise in violence. Alfredo Beltrán Leyva, “El Mochomo,” was a top level drug boss of the Sinaloa Cartel when in January 2008 he was captured by the Mexican Army. His brothers blamed the leader of the Sinaloa Cartel “El Chapo” Guzmán for his arrest. This caused a rupture inside the Sinaloa Cartel as the Beltrán Leyva brothers and their associates went to war with the rest of the Sinaloa Cartel. Given that the Beltrán Leyva brothers ordered the killings of the son of “El Chapo” and the son “El Ondeado,” it is all but certain that the kidnapping and subsequent killing of Nacho Coronel’s son was revenge for the capture of “El Mochomo.” Thus, I find it a glaring omission that Poiré and Martínez would not analyze the capture, even if they were partly right about the kidnapping having sparked a new round of violence. 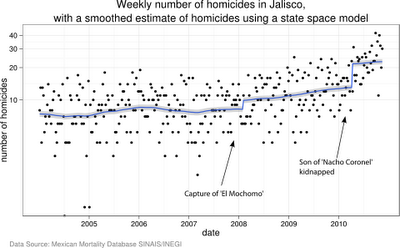 In addition to the structural change I used a dynamic linear model or state space model to compute the kalman smoothed value of weekly homicides adding dummy regressors indicating whether “El Mochomo” had been captured or the son of “Nacho Coronel” kidnapped. 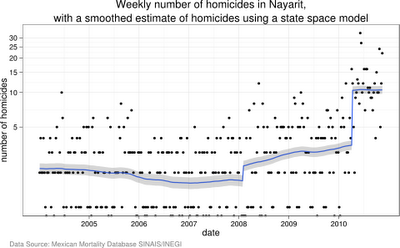 Repeating the analysis with data from the nearby states of Nayarit and Colima I find similar patterns. Though it would be a good idea to take into account zero inflation and the analysis is further complicated in Nayarit since a week after Nacho Coronel’s son was kidnapped the local Beltran Leyva plaza boss was killed in a joint operation by the Mexican Army, Marines, and Federal Police (this is likely related to the kidnapping). As we can see from the charts and contrary to what Poiré and Martínez express in their article, the fall of drug lords sometimes does coincide with an increase in homicides, and may drive them to seek revenge on their rival’s families.